Queen Potema, the "Wolf Queen of Solitude", the daughter of the Emperor Pelagius Septim II, wife of King Mantiarco, aunt of the Empress Kintyra II, mother of Emperor Uriel III, and sister of the Emperors Antiochus, Cephorus I and Magnus, is best known for her role in the War of the Red Diamond. In 3E 120, she launched a rebellion, and overthrew her niece Empress Kintyra II the following year so that her son could become Emperor Uriel Septim III. Although the war ended in 3E 127, it was another ten years, capped off by a month-long siege at her castle in Solitude, before Potema herself was defeated. 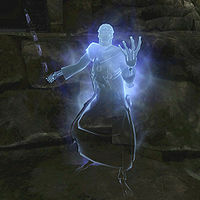 She has been described as "unambiguously evil", and is remembered as one of the most dangerous necromancers in the history of Tamriel. For more information, see the lore article. While investigating a cave, you will interrupt a ritual to summon her. She is little more than a disembodied voice at this point. However, some time later it appears the summoning did at least partially work and you are sent to deal with her after her disciples tunnel into the Temple of the Divines in Solitude. The second encounter is when the actual physical entity of Queen Potema will be seen. This is one of the more unique battles in the game; details can be found in The Wolf Queen Awakened. Her remains consist of a skeleton. Her spirit can respawn several times from her remains, but once she is finally dead you can take her skull, which is her link to the present and the only thing tying her to the mortal plane. Potema's remains wear a fine raiment, along with a copper and moonstone circlet. She is armed with a leveled sword enchanted with shock damage. 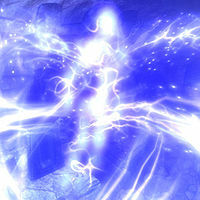 Aside from her ghost ability, she knows the following spells: Lightning Bolt, Lightning Cloak, Sparks, Lesser Ward, Reanimate Corpse, and Conjure Storm Atronach. Additionally, she knows the Unrelenting Force shout. The Man Who Cried Wolf: Investigate reports of strange happenings in Wolfskull Cave. The Wolf Queen Awakened: Potema must be stopped. She is the subject of the books Biography of the Wolf Queen and The Wolf Queen, v1 to v8. She appears in two different forms, as a wisp (the top infobox) and as a skeleton (the bottom infobox). Potema's Remains can be soul trapped during the fight with her. Doing so may prevent the bug in which she respawns from occurring. There's a glitch with the Wabbajack that can happen with Potema's Remains, that allows you to loot her fine raiment. This page was last modified on 12 June 2018, at 23:43.